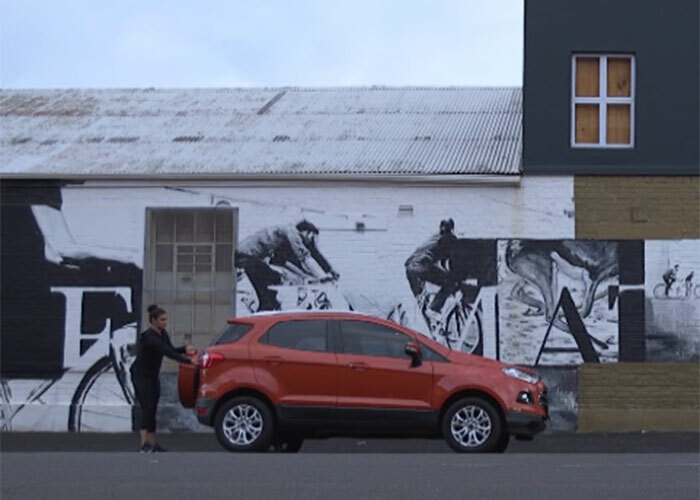 Last week’s Carkour Challenge saw Ewan take the lead in the challenge set, successfully closing the gap between himself and Zoë even more, putting him back in the running for the Ford EcoSport Challenge title. Our contenders found out that their opponent had nominated them for their next challenge. Zoë found a pair of toy boxing gloves and Ewan found Wax Strips and Nail Polish hiding in a storage compartment in the Ford EcoSport boot. Zoë headed over to the Armoury Boxing Club in Buchanan Square, Cape Town, where esteemed Boxing Coach, Lillian gave her a lesson in the art of this awesome sport! Ewan jumped out of the car at Sorbet in Parkhurst, where he was greeted with big smiles from the beauty therapists ready to lead him to his treatment. If one thing is certain, it’s that our dynamic duo really know how to put each other out of their comfort zones! Who will face the challenge head on? And who will crumble under the pressure? Zoë took to boxing like a champ, throwing quite a hefty right hook. While she learned a few basics Ewan was lying back for an eyebrow wax, following with a nose wax! Yep! He was in for quite a shock! Once Zoe had the basics down pat – Coach Lillian announced that she was ready for a bit of controlled sparring with one of the Armoury members. Leisl! Zoe was shocked to say the least, but she bravely put on a gum guard and helmet and limed into the ring. Ewan was very happy with his eyebrows, but the sensation of hot wax in his nostrils being yanked out without warning – not so much! Tears filled his pretty eyes just in time for round two of the nose wax. Zoë, being the taller of the two, had the upper hand, but Leisl had done more training making it a very fair spar! Zoë kept her head in the game and Leisl was impressed with how well she was doing. After a small knock to the chin, Zoë panicked but kept her wits about her and stayed strong and remembered her training. Zoë successfully completed the challenge with grace! Although “fighting isn’t for her” she aced the challenge. With a little more practice and prep she would definitely try boxing again! Ewan also successfully completed his challenges and although the nails didn’t look great – we admit he handled that with a whole lot of class! With both our contenders really giving it their all – they couldn’t be faulted and they were tied for the nomination challenge. With only one challenge left and one chance for Ewan to rev into the lead, it is going to be a very close call.